Artificial intelligence (AI) and automated messaging may not be the first thing that springs to mind when you think of marketing your retirement developments, particularly given the older demographic target market. However using technologies like these can increase your marketing ROI and create an improved pre-sales experience. In this article I’ll run through what these technologies are and how you might implement them with respect to Facebook Messenger as part of a larger online campaign. I’ll also look at why you should be using Facebook Messenger in your advertising and how you can benefit. According to Statista, over 1.3 billion people use Messenger every month. Facebook opened the platform to advertising in 2016 and as a result you have another way to access to Facebook’s huge user base. Initially using messenger apps as an advertising medium can seem trivial, however some agencies are seeing upwards of 80% open rates on Messenger ads compared to a 10-15% open rate on email. Artificial intelligence is a vast topic and in this article we are going to limit our discussion to exploring it as it relates to automated messaging or “Chatbots”. These bots are typically a predefined series of answers or steps that you setup to guide customers to a conclusion such as submitting their details for more information or calling your sales team. The AI component arises from the ability of these bots to recognise language and take steps accordingly. For example, if you have a visitor who midway through a predefined sequence enters the word “I want help”, the Chatbot recognises the term as being similar to “help”, and breaks the visitor out of the sequence and gives them the option of calling you directly or chatting with a live sales team member. So rather than the visitor being stuck within a series of predefined options, they are channeled appropriately resulting in a better user experience and a better business outcome for your company. So how might you implement a Facebook Messenger campaign? One scenario might be as part of a remarketing campaign. Prospective customers visit your website, browse around but don’t take any conversion actions such as submitting an enquiry or calling. Using the Facebook pixel we add these people to a remarketing list. 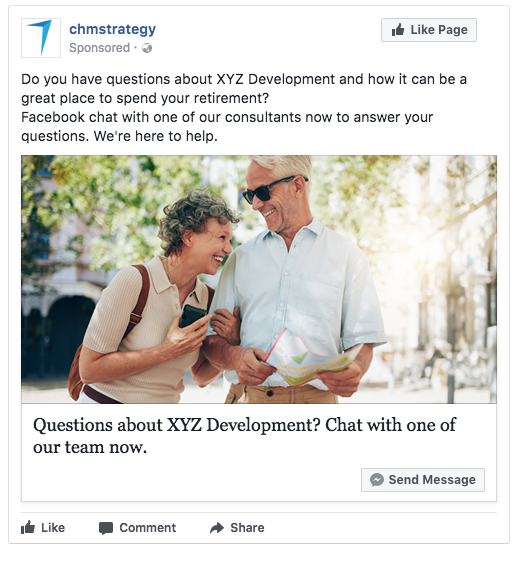 Next time they visit Facebook, we show them an ad in their newsfeed, asking them if they’d like to have their questions answered. Clicking the image or “Send Message” opens a conversation in Messenger. From there you you funnel the conversation into a Chatbot which leads them through into making an enquiry. Using AI they can trigger a live chat with one of your sales team. 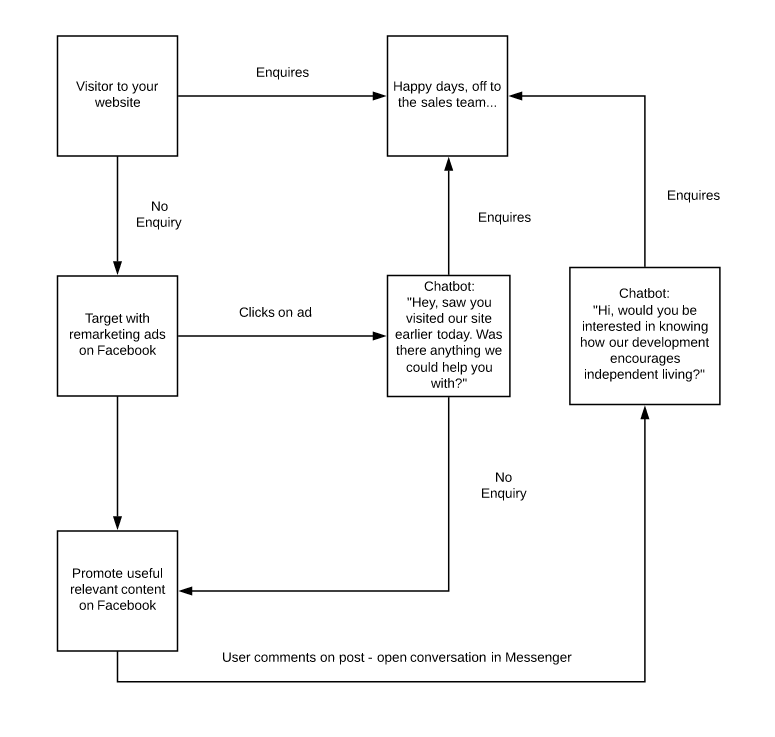 This diagram gives an overview of the process and some suggestions as to how to continue to engage with visitors, even if they don’t use your Chatbot initially. Chatbots clearly aren’t a be all and end all for your marketing. However they can form an effective part in your marketing strategy. To get help with using techniques like this in Facebook, book a Strategy Session now by clicking this link.